The ideal wedding band for the modern minded man. 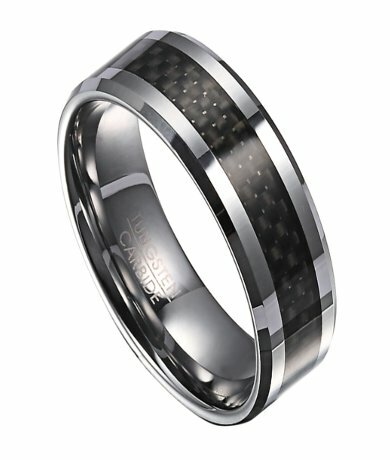 This two tone tungsten wedding ring for men features a black carbon fiber center inlay framed by polished beveled edges. With its flat profile and 8mm comfort fit band, this ring is equally suitable as a contemporary wedding band or engagement ring for men.Comfort-fit rings should be ordered 1/2 size smaller! Great ring choice. Does not tarnish nor scratch. Received several compliments upon wearing it and continue to receive the same frequently. Nice product, as described. Good advice on the web page for the sizing a 1/2 size smaller for the comfort fit. I've received positive comments when I have worn it. Good service, follow up email after delivery was a nice feature and the reason why I am writing this review. I waited to the last minute to look for my soon to be husband a ring. He is a big guy and I couldn't find plus size rings. I ordered this amazing ring one a Thursday and I had it in hand the following Wednesday. The ring definitely lived up our standards. I ended up having to return for a smaller size but even the return was with in 48 hours. My husband and I are very pleased with the business we have received. Thank you! !